I teach weekly classes at my home in Glasgow on Wednesday mornings, 10 am–12 noon, and afternoons, 2–4 pm. My classes are for all levels of expertise from complete beginners upwards. I usually have at least one beginner, but most people have been coming to the classes for a while — some for over ten years! At the moment I have students working Torchon (some of it in colour), Bucks Point, Bedfordshire, Honiton and needlelace. At my classes most beginners start off with a sampler of stitches — cloth stitch, cloth stitch & twist, and half stitch — and then move on to the basics of Torchon lace, finishing with a simple fan edging. So that students have something to refer to between classes I also provide written instructions, Bobbin Lace — Getting Started and Torchon Lace Basics, which you are welcome to download for your own use. 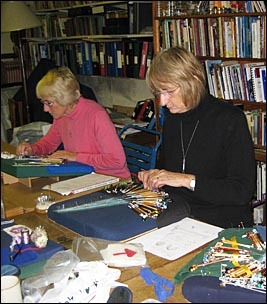 If you've been wondering about trying bobbin lace they will give you some idea of what is involved. And if you decide to go ahead you are welcome to with any questions or problems you may have.